The B&G company was started in 1940s with a goal in mind to make a compressed air sprayer for professional pest control. Now the company produces different fogging equipment and has got a large facility in Jackson GA. Their products have high standards and are used by professionals in many pest control applications. 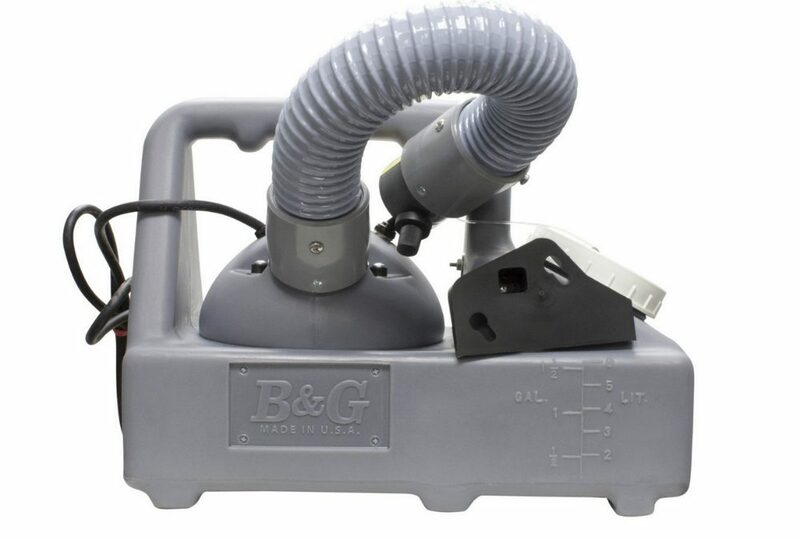 B&G company has got an experience in producing different pest control products and Flex-A-Lite 2600 is their professional insect control fogger. 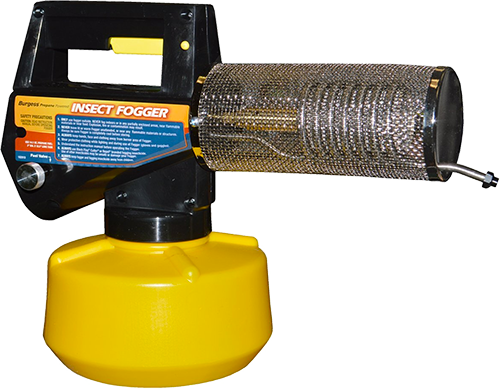 These are top class foggers that are used not only by individuals to fog their homes and backyards, but also by professional pest control companies. This is an ULV fogger with adjustable flow rate and particle size that can output a fog or a light mist depending on what application you will use the fogger. B&G 2600 fogger is made primary for insect control, but because this is universal ULV fogger that can be used with both water and oil based solutions, you can also spray different sanitizing, disinfectant or mold control solutions. All B&G foggers meet high quality standards and are made in the USA. 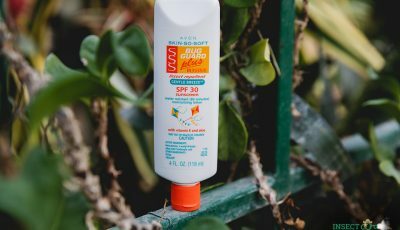 The fogger is made from a durable plastic material, the plastic is corrosion resistant so you can use the tool in both indoor and outdoor spaces. Because of the durable plastic material, this tool can spray both oil or water based solutions, so it can be used for wide range of applications. On top of the fogger there is a large and comfortable handle that allows to carry the fogger around more easy. The fogger and the solution tank a both made into a single device, so you won’t be able to detach the solution tank from the fogger, this also increases durability of the unit. B&G fogger features a low profile design, so it sits firmly on the ground while you fog around using the flex hose. This is a problem for other ULV foggers that are narrow but long and can easily tip over. The nozzle of the fogger is positioned in a 45 degree angle, but as the unit comes with a flex hose you can position the hose in any direction. Fogger has got a 2 stage motor available in 110V and 220V versions. The solution container that is built into the fogger has got capacity of 1.5 gallons (5.6 l). The top of the solution tank is pretty wide for easier filling and emptying of fogging solutions. There is a metering line on the side of the solution tank with both liter and gallon marks, so you know exactly how much fogging solution is left in the solution tank. Fogger is equipped with a high capacity nozzle that can output particles from 20-56 micron size. There is an adjustment knob on the nozzle which allows to adjust the flow rate and particle size of the mosquito fogger. B&G fogger allows setting the flow rate from 0-18 oz (0-0.5 l) per minute. Higher flow rate will produce more powerful stream of mist with larger particles over 50 microns that are good for applying solutions for odor control, while lower flow rate will output smaller particles closer to 20 micron range that are great for mosquito control. Fogger is also equipped with 18 inch (45 cm) long flex hose. 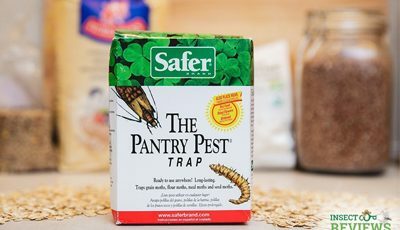 This can be used to fog harder to reach areas such as below the house, clogged rain gutters and similar areas for pest control. You can also get the fogger with longer 36 inch (91 cm) and 48 inch (122 cm) hoses if needed. Fogging with B&G 2600 ULV fogger is easy. As mentioned the fogger is universal and can be used with oil and water based solutions, so you don’t have to worry that you will pour in the wrong fogging solution. The fogger can be used to spray solutions in fire or flood prone areas, you can also use it to spray disinfectant liquids for odor control or mold control solutions. 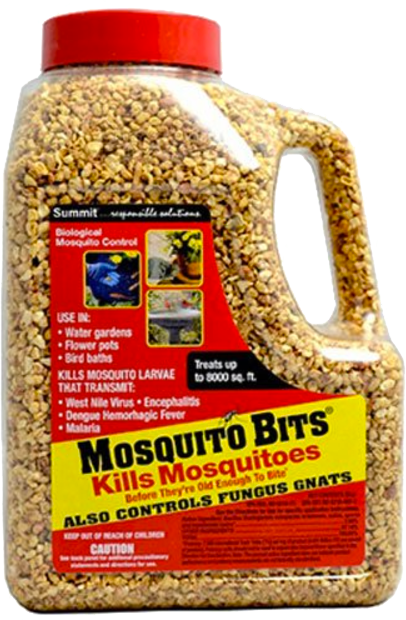 This tool is also great for insect control and can be used to spray insecticide for different outdoor and indoor insect and pest control such as ants, fleas and others, and you can use it as a mosquito fogger. The unit can be carried around thanks to the large handle on the top, but it still is not a portable fogger as thermal foggers are, because it needs to be attached to an electricity source in order to work. The fogger also has a low profile design and is very stable when placed on the ground, so you don’t have to worry about accidentally tipping it over while fogging. There are few tips you need to know before using the fogger. First you must calibrate the unit by closing the adjustment knob, which is located on the front of the hose and turn it by pushing down on base of the knob and align it with the small groove on the nozzle. Opening the knob half way will produce an ULV fog with smaller particles useful for insect and pest control. Fully opening the knob will produce a powerful wet mist with particles larger than 50 micron size. There is an important order for turning the fogger off. First you must close the adjustment knob and only then turn off electric power of the fogger. Doing it in reverse order will make the fogging solution to start dripping back into the hose which might reach and damage the motor of the fogger. 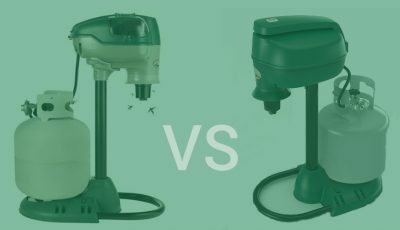 The size of B&G Flex-A-Lite 2600 fogger is 18x11x13 inches (46x28x33 cm) and the weight of the fogger is 11 pounds (5 kg). The manufacturer provides a 1 year warranty for the product.